Welcome back to Friesen Friday. Today’s tutorial is taken from Christi’s book on page 31. As you will see as you open the book, there are no tutorials for this project! It’s a page of 20,000 Leagues Under the Sea! It includes seahorses, fish, dragons, turtles, and many more. Since we have done the “Under the Sea” book, the individual tutorials for many of the projects will be linked below. This tutorial is my own, and not from Christi’s book, but is definitely Christi inspired. 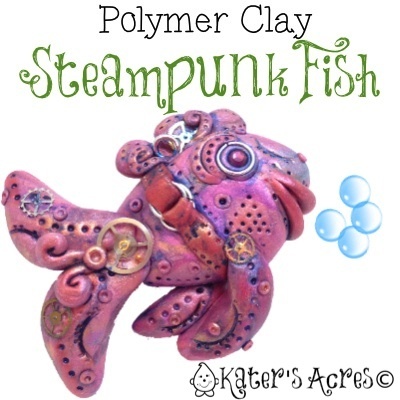 Polymer Clay Steampunk Fish Tutorial by KatersAcres http://t.co/jKwipViarR Come and make your own cute steampunk style fishie today! Using pages 30-31 as a guide, make your own 20,000 Leagues Under the Sea Creation. An up-cycled baby food jar or an jar you have around the house. First begin by choosing your clay colors. Since we are working through the book “Steampunkery” the colors should be metallic in nature. Note: I have used the following colors from the Premo! Line: Magenta Pearl, 18K Gold, & Silver. Next, marble your colors together. (If you are using a solid color, be sure your clay is fully conditioned). Note: Marbling the clay will also condition your clay at the same time. Make a log out of your blend. Cut your log in half. You will use one half for the “body” and one half for the fins & details you will be adding. Shape one piece of your log into a football shape and smoosh slightly onto your work surface to give him a flat back. Size Note: My fish body was approximately the size of a walnut, make yours whatever size you would like, bigger or smaller is just fine. Note: I am making an ornament, so my piece does not need to be 3D. If you need your piece to be 3D, do NOT smoosh it onto your work surface after making your football shape. You will now be using the other half of your original log you set aside. To make the fins you will need to cut off pieces of the log (the size of piece is your decision). You will need to cut off two large sections for tail fins. You will need to cute two smaller pieces for his/her bottom fins. Shape each piece into football shapes. Attach the two large ones to the “back” of the fish body. Attach the two smaller ones to the bottom of the fish body. Blend your seams (not shown). Note: Before you finish this step and move on, be sure that you have signed the bottom of your piece. Note: Steampunkishness …. is that a word?! Add a mouth to your fish by using a sculpting tool and making a “gash” where you want your fish’s mouth to be. Add lips if you choose. Note: Make your lips BIG and BOLD if it’s a girl fish, smaller if it’s a boy fish. Next, embed an eye into your fish. See this tutorial for detailed instructions. Note: Since I wanted my fish to be “cute” and “lively” I gave my fish a purple eye! Looks rather nice, I think. Don’t forget to give your fish some dorsal fins! Note: You can use metal components, shells, beads, whatever you’d like to add for his/her dorsal fins, but please make sure your fish has some! Add a buckle, add screws, gears, cogs, indentations, dots, lines, armor, or whatever else you’d like! Make this fish your own and think metallic! Note: For my fish, I took a “gear” and indented it into his body is several places for a cool effect. I also used it to make pressed patterns in his body (check around his lips and next to his buckle). For the finishing details, take all those sprockets, cogs, gears, watch parts, fun stuff, nail heads, and whatever else you’ve managed to gather up and add them however you’d like! Don’t forget your tried and true, mica powders to add some shimmer, sparkle, & metallic effects. NOTE: I made my own acrylic antiquing medium by using a cadmium blue and cadmium red to create my own “purple” wash. I used more blue than red to give it a richer color. This color combination added an awesome “punch” that my piece needed to pick up all the details.